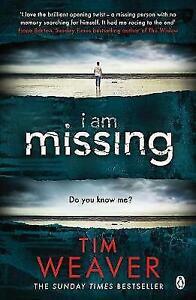 Author Biography Tim Weaver is the Sunday Times bestselling author of the David Raker Missing Persons series. Weaver has been nominated for a National Book Award, selected for the Richard and Judy Book Club, and shortlisted for the Crime Writers' Association Dagger in the Library award, which considers an author's entire body of work. His seventh novel, Broken Heart, was longlisted for the Crime Writers' Association Ian Fleming Steel Dagger award.He is also the host and producer of the chart-topping Missing podcast, which features experts in the field discussing missing persons investigations from every angle. A former journalist and magazine editor, he lives near Bath with his wife and daughter. Wow, it is a long time since I have read such a fantastic story, I would highly recommend anyone to buy this book, I read it in two days, I just could not put it down. The story line is amazing was sorry when it was finished. Not a detective yet equally intriguing. Interesting character .